Some say it’s the greatest city in the world, so why not consider your wedding day in one of many London wedding venues. Spring and summer are the most popular times of year for weddings in London and it provides an obvious choice of location for your special day as there is a wealth of beautiful and unusual venues for your civil or religious ceremony and reception. However, bear in mind that a wedding in London costs, on average, around 15% more than in other parts of the UK, predominantly due to the cost of the reception but it’s worth it! Walk down the aisle inside London’s Natural History Museum. Breath-taking architecture and spectacular collections make for a stunning backdrop to your vows. 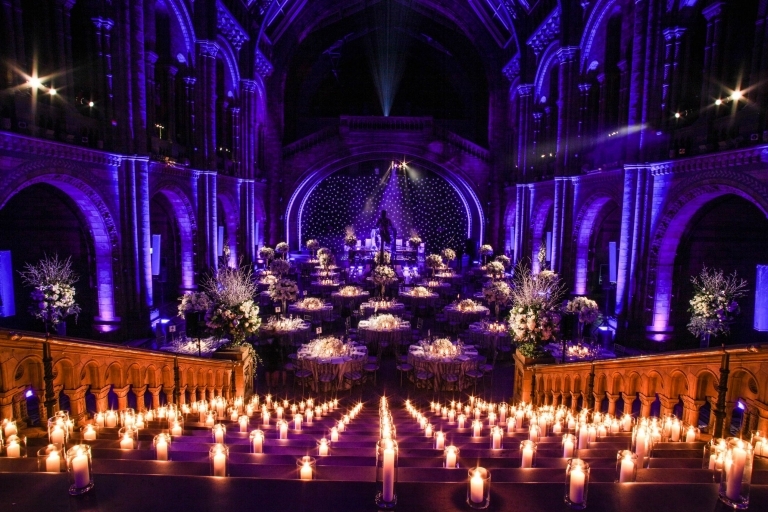 Choose between eight spaces in which to host your event: from the popular Hintze Hall with its beautiful arches to Fossil Way, home to the giant Stegosaurus fossil, or even the North Hall, the perfect place to soak up the Museum’s grandeur. This is one of my favourite London wedding venues. Located in the heart of London, the River Rooms at The Mermaid London is a modern and versatile wedding venue in a stunning location with panoramic views over the Thames towards the Tate Modern, which makes it the perfect location for a city wedding. 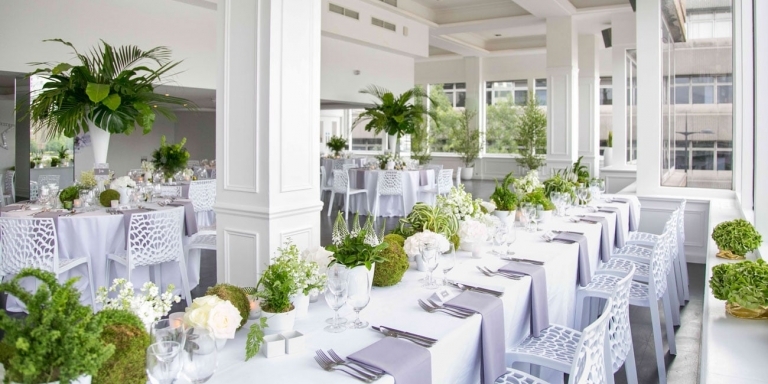 The River Rooms understands that it’s the little touches that make your wedding day truly yours, and are happy to allow you to dress the space to your specifications; their experienced event planners are on hand to help you throughout the planning process to make sure every last detail is flawless. The River Rooms is a modern addition to The Mermaid London, which historically was called the Mermaid Theatre. As one of London’s most illustrious playhouses since its foundation in the 1950s, the Mermaid Theatre was known as a popular music venue throughout the 1960s and 1970s. Located on the banks of the River Thames and conveniently located just a few minutes’ walk from Blackfriars Station, the River Rooms is a stunning venue in a highly convenient location, wedding spaces and delicious food that’ll make your special day one to remember. Choose from four venues around the gardens to tie the knot. From the stunning Nash Conservatory, which offers an abundance of natural light, to Temperate House, the largest Victorian glasshouse in the world. The Cambridge Cottage is the spot for those who want a boutique wedding. 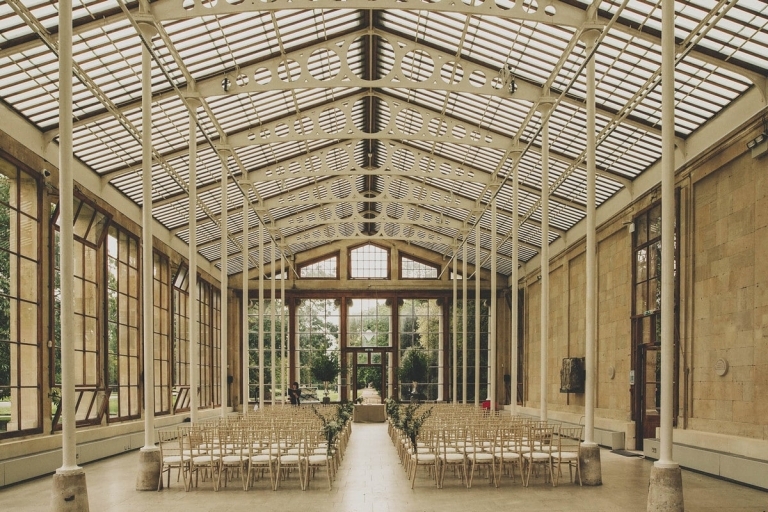 For those who want a large wedding, choose the Orangery, with its stunning arched windows and high ceilings, you’ll be sure to make an impression on your friends and family as you dance the night away in this Grade II listed exquisite building. IWM London has been transformed. Designed by Foster + Partners, a spectacular new Atrium forms the heart of the museum and a breath-taking hanging gallery in the rooftop provides dramatic views of the floors beneath. Along with the remodeled daytime meeting and conference rooms, IWM London provides the perfect showcase for events big and small, traditional and low-key or high profile and inspirational. The main Atrium – a stunning 25m-high space – benefits from great flexibility. Accommodating up to 350 for dinners and receptions up to 400, the backdrop of large exhibits on display, including a rare Battle of Britain Spitfire; a Harrier jet used in Afghanistan and a German V2 rocket, really give this space the wow factor. The Atrium, together with the galleries in the entire museum, can cater for receptions for over 1000 guests. IWM London is the flagship venue for Imperial War Museums (IWM). It is the perfect venue for event organisers of strong brands, exciting innovators and forward-thinking organisations. From breakfasts, receptions, seated dinners, meetings and lunches to presentations and private celebrations, IWM London delivers a wide range of successful events that will leave your guests with a lasting impression of their experience here. Located in Central London close to the City, Westminster and Southbank, IWM London’s famous façade is a stunning Grade II listed building formally home to the “Bedlam” hospital and is one of my favourite London Wedding Venues. The venue has excellent transport links being just a 10-minute walk from Waterloo and 5 minutes from Lambeth North tube station. Just a stone’s throw away from Regents Park station is the stunning, Grade I listed One Marylebone, one of London’s leading unique venues. Only one of only three London churches by Soane, the venue is most architecturally distinguished with a beauty of national and architectural significance. Fall in love with the beautifully landscaped gardens and breathtaking courtyard and choose between two exclusive spaces for your perfect day. The 27 foot high Soane Hall with its stunning mosaics and stained glass windows or the U-shape Galleries with marvelous floor to ceiling windows that let in natural light. A beautiful blank canvas venue in the heart of East London. The Old Parish Hall is a fabulous alternative venue for wedding receptions, parties, events, workshops and celebrations. It’s mixture of historic and modern features make it an exciting and dynamic space to host a party. The size of the space and natural light creates a sense of scale that’s perfect for special occasions. A versatile space and large blank canvas which allows you to add your special touches. The Old parish hall is the perfect space for couples looking to put their own stamp on their wedding venue and let their personal style shine through. We are not a package deal kind of place. We can offer you the flexibility to cherry pick your wedding suppliers so you can create your perfect celebration. If you need help planning or executing your event then we also have a curated list of recommended suppliers and wedding professionals. Our venue is a space for community, wellness and celebration. Core Clapton is also a registered charity and by hiring our spaces for your wedding you will be investing back into our community initiatives. Bring your most dreamed about day to life and spend it inside the largest conservatory in London with your nearest and dearest. One of London’s most iconic buildings, Barbican is not only home to exotic fish, but also over 2,000 species of plants and trees, which form the most astonishing backdrop to say ‘I do’. Choose your own bespoke food menu, whether its 6 course banquet, street food stations or a sizzling BBQ. Described by the Queen as “one of the modern wonders of the world”, who wouldn’t want to get married in this amazing tropical oasis? Nonsuch Mansion is completely exclusive This not only means that yours will be the only wedding taking place at the spectacular mansion, but you will also enjoy the undivided attention of our expert wedding team. There is no such venue as Nonsuch Mansion, with a history dating back to Henry VIII, they specialise in unforgettable weddings. They have a completely unique approach to planning a wedding; one that is flexible, bespoke, stress-free and offers dedicated wedding planning throughout. We are licensed to hold civil ceremonies for up to 120 people. Alternatively, we are happy to recommend one of our lovely local churches which are just a short distance away from the mansion. Food is their passion. Nonsuch is owned by Bovingdons Catering so your wedding breakfast is in the very safe hands of our Michelin trained chefs. Each dish is created using the finest seasonal ingredients to produce the most exquisite dishes. They can fit 120 for a seated dinner and up to 200 people standing. For only the most enchanting love stories, The Swan Restaurant inside Shakespeare’s Globe offers the chance for a Romeo and Juliet moment. The Balcony Room has panoramic views of the River Thames through its wooden doors and large French windows, seating up to 70 of your closest friends and family for an intimate celebration. The Underglobe is also situated below the Globe Theatre and offers a blank canvas for the occasion. White drapers fill the room and a sweeping staircase and full-size model oak tree completes the ultimate grand entrance for 100-350 of your guests to witness. The perfect place for a quintessential London wedding, Dartmouth House features only the most elegant interiors to wow your guests on your big day. The Grade II listed building offers three spaces: The Long Drawing Room, The Small Drawing Room and The Churchill. Each room has seating for around 100 guests and standing room for 450. The mansion also has a courtyard, a private and secluded haven if an open-air reception is more your style. Situated in the heart of Mayfair, the mansion features a grand marble staircase to make sure you get all the insta-worthy wedding shots. Fall in love all over again at Syon Park as you and your partner celebrate your special day at this idyllic venue. Be as intimate or extravagant as you want with 50-800 of your most loved friends and family in this sublime London home of the Duke of Northumberland. 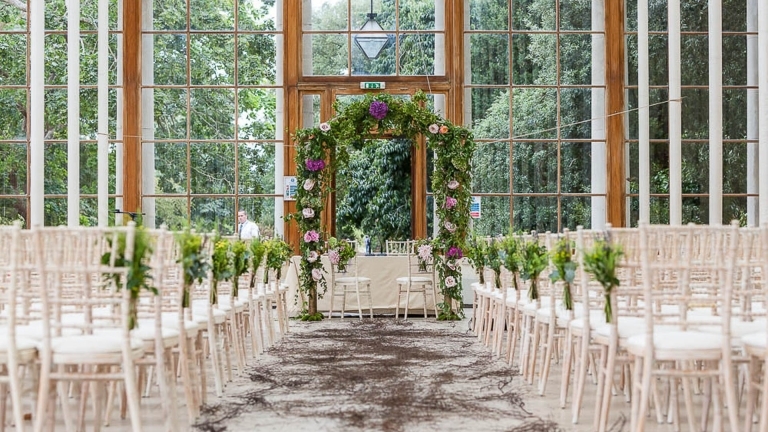 From the impressive and majestic Great Hall to the intimate State Dining Room, or even the stunning Great Conservatory and Garden Room Marquee, you can design your wedding however you dreamed! Feel like a real-life princess and get married inside Britain’s first and finest classical building. This unique wedding venue takes its place inside Greenwich Park and offers sublime views over the Thames and Canary Wharf. 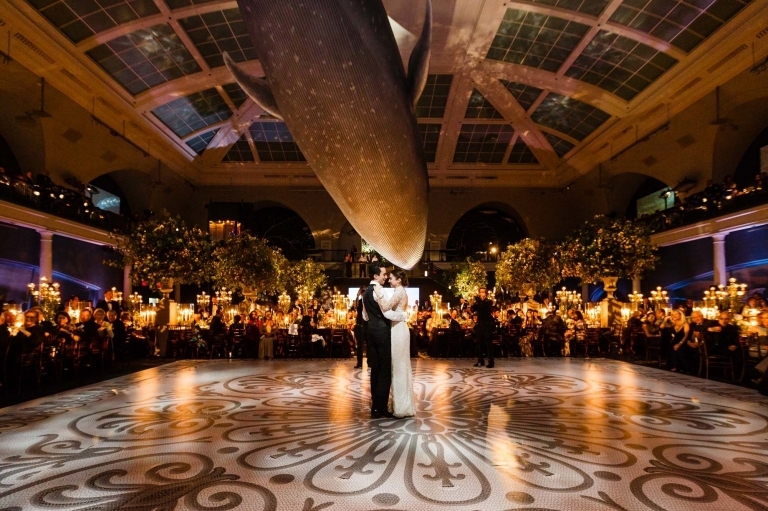 A masterpiece of 17th-century architecture, the venue comprises is a spacious 40-foot Great Hall with classic black and white geometric marble flooring on which to dance your night away. The marvelous Orangery, Parlour room and the vaulted Undercroft are the most perfect place to toast to a happy couple. Say ‘I Do’ up in the clouds and spend your big day in one of London’s most iconic buildings, surrounded by striking 360 degree views of the city. The breath-taking space is located on the 39th and 40th floors of The Gherkin and offers one of the most elegant and private settings around. Invite 140 of your friends and family to celebrate your day and experience culinary delights up in the sky, whilst sipping champagne naturally. Have your first dance as a married couple whilst the sun goes down over London’s beautiful skyline. One of the best London Wedding Venues. Perfectly placed for central London private parties, Cinnamon Kitchen has a range of spectacular spaces, which can cater for everything from small social gatherings, weddings, corporate parties and everything in between. Choose from the intimate elegance of the private dining room or the spacious terrace, featuring fantastic views of the Gherkin; or – for a real wow factor – book the entire venue. If luxurious cocktails are the order of the day then adjoining sister cocktail bar, Anise, is also available for parties and events. There are so many beautiful London Wedding Venues and Anise is one of them. A contemporary bar and lounge offering imaginative cocktails and a great selection of wines and premium beers in the heart of the City of London. An imposing carrera marble and pewter bar is a feature in this stunning space. Drinks are not the only option and guests keen to eat can choose from a range of small plates or more substantial bar platters. Inspired by the restaurant’s cuisine, yet with very much its own style, Anise offers our take on some very popular Indian street food, but with a twist. Anise bar is ideal for cocktail parties, presentations, receptions and networking events. A true London gem, this Grade II listed hall offers the chance to get married in the world’s oldest grand music hall. The auditorium still retains many of its original features, including its famous barley-twist columns. With only a small amount of dates available each year, this is one of the most exclusive wedding venues around and features interiors that inspired Moulin-Rouge. Gary is a wedding photographer in London and Milton Keynes, building wedding stories around the world. You can check his available by getting in touch. Hope you enjoyed looking through my favourite London Wedding Venues.